Providing Tomorrow's Cleaning Solutions, Today! for a tough cleaning job done right. For nearly three decades, the PHW has been the flagship of the LANDA hot water pressure washer line. The PHW is heated by diesel or fuel oil using a high-efficiency burner. Other quality features include heating coil made of Schedule 80 steel pipe; top-of-the-line, low-RPM, belt-drive, tri-plunger LANDA pump with U-seals and 7-year warranty; detergent metering valve for convenience in adjusting the flow of the soap; and an extra rugged fuel-water separator for burner protection. The cool bypass feature keeps water temperature low while in bypass. The balanced distribution of weight, 13" tires and easy-grip handles make maneuvering the PHW a breeze. Snap-N-Go plugs allow the addition of time delay, auto start/stop or LanCom wireless remote options. For more than a decade, the PGHW has been LANDA’s most popular gasoline-powered, hot water pressure washer. The PGHW combines the versatility of a compact size yet the ruggedness and cleaning power of a full-skid pressure washer. Five PGHW models deliver cleaning power of up to 5000 PSI with a flow rate of up to 5 GPM. The PGHW is packed with power by reliable Honda, Vanguard or Kawasaki electric-start engines, the PGHW models feature top-of-the-line, oil-bath, tri-plunger, belt-drive and a Land pumps with a 7-year warranty. The heating coil is made of 1/2-inch Schedule 80 cold-rolled pipe (Schedule 160 on 5000 PSI model) with a stainless steel outer top wrap. The sturdy steel frame gets all-weather protection from an epoxy powder coat finish. 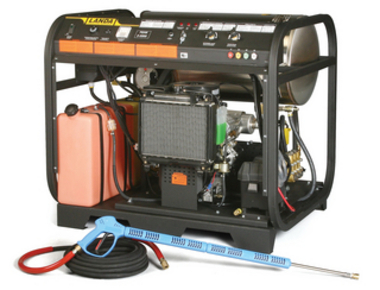 A 2,000 watt generator provides power for the burner as well as a 120V outlet for low-wattage applications. 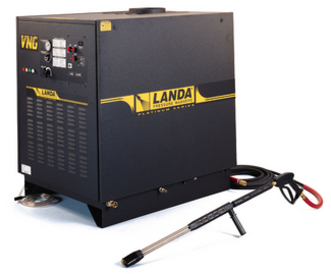 The PGDC has all the ruggedness of LANDA’s famous line of skid-mounted hot water pressure washers but features a 12VDC burner system instead of a generator. The PGDC is powered by reliable 13-20 HP Honda or 16 HP Vanguard engines, all with electric start. The PGDC has a top-of-the-line, oil-bath, tri-plunger LANDA pump with 7-year warranty, a Schedule 80 heating coil made of 1/2-inch cold-rolled pipe covered by a stainless steel top wrap, and an extra-rugged steel frame protected by an epoxy powder coat finish. The PGDC needs no electricity. Simply provide water and it’s ready to clean almost anywhere outdoors. The 5-gallon gasoline and 10-gallon diesel tanks allow for hours of continuous cleaning. The PGDC can be easily fitted with an optional wheel kit to make it even more portable for on-site cleaning. 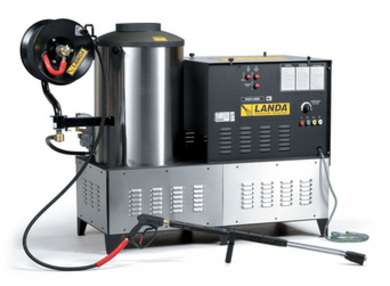 LANDA’s VNG is the industry standard for natural gas heated hot water pressure washers. Housed in an attractive, but sturdy, metal cabinet with quick access control panel and industrial-duty components throughout, the VNG is flexible enough to support up to four optional remote wash stations. The VNG is loaded with quality and safety features. Standard VNG features, not often found on other brands, include time delay shutdown, electronic ignition, steam combination, stainless steel variable pressure wand, and pressure gauge. The VNG’s super-efficient burner has an energy-efficient, vertical, Schedule 80 heating coil and, for 6-8 GPM models, a modulating thermostat to regulate the gas flow in multi-gun operations. The VHG, with its fuel-efficient burner and vertical hot water coil, is the most compact natural gas hot water pressure washer on the market today yet is packed with Landa quality. The VHG is only 24-inches wide, 53-inches long and stands 49‑inches high, an amazingly small footprint for all of the features and quality it possesses. Plus there are larger models for the bigger cleaning jobs. 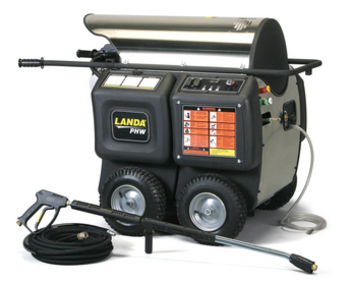 LanCom, LANDA’s exclusive wireless remote operation of a pressure washer, is now available for factory installation on any VHG natural gas heated hot water pressure washer! 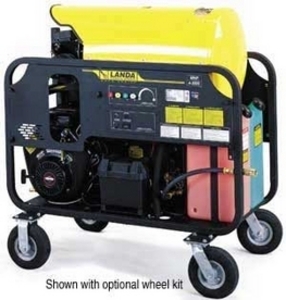 The VHG boasts many of the industrial-grade components and safety features that have set apart LANDA pressure washers as the most dependable and safe in the industry. For instance, the VHG burner comes with standard electronic ignition on all models. The heat is retained in Landa’s carefully crafted heating coils made of leak-free, cold rolled, half-inch, Schedule 80 steel pipe. The MHP is a self-contained, mini-skid, hot water pressure washer with an extra narrow frame for maneuvering through doorways. While it is considered an economy model, it is still packed with LANDA quality, including reliable Honda or Vanguard engines all with electric start, top-of-the-line, belt-drive, tri-plunger LANDA Pump with 7-year warranty, Schedule 80 heating coil made of 1/2-inch cold-rolled pipe, and extra rugged steel frame protected by an polyester powder coat finish. The MHP is easily fitted with an optional wheel kit to make it portable for on-site cleaning. No electricity is needed. Simply provide water and it’s ready to clean most anywhere outdoors. The two five-gallon gasoline and diesel tanks (16HP model only) allow for hours of continuous cleaning. The MHP comes standard with the bracket needed to add an optional hose reel for tangle-free washing and additional high-pressure hose protection. 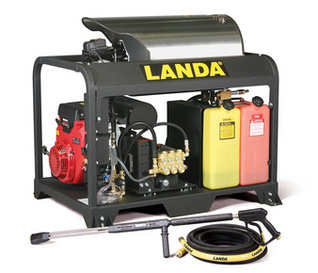 Click on the LANDA logo to the right and go directly to their site for more models and information on high-performance pressure washers.